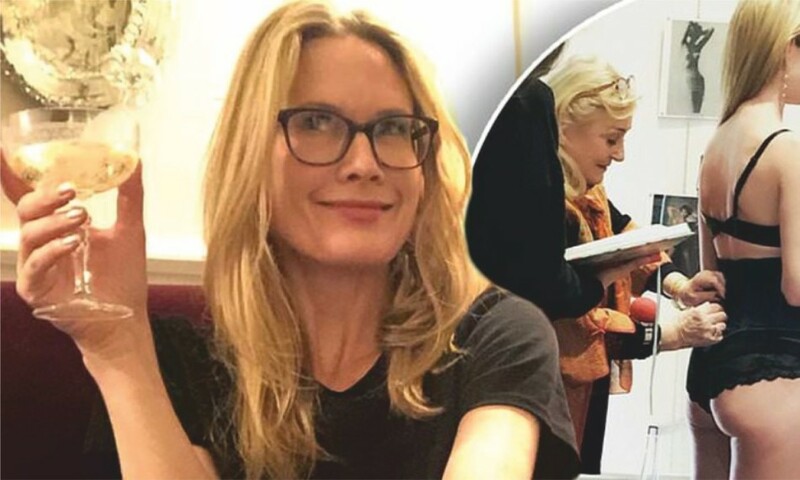 Stephanie March seems to be enjoying her life as a wife of a millionaire. On Sunday, the actress shared a selfie of herself drinking champagne on a plush sofa in Paris, France, explaining: ‘Every time I fly to California I think, “It is just as easy/hard to get to Paris from NYC.”‘ ‘This time Dan took me up on it… #spontaneousparis,’ she added. Dan is the 44-year-old actress’s husband Dan Benton, 58, a tech investor and founder of Andor Capital. On Monday, the celebrity who plays Assistant DA Alexandra Cabot in NBC’s long-running series Law & Order: Special Victims Unit, shared a shot of herself being measured up for undies. ‘The ultimate luxury #custom #lingerie,’ she captioned the shot.Stephanie married Dan in Africa in September 2017. The couple were introduced by a mutual friend in October 2015, several months after her divorce from celebrity chef Bobby Flay after 10 years of marriage. ‘They met for cocktails at the West Village bar Orient Express and had dinner afterwards,’ a friend dished to People. ‘But their first real date was a TED Talk [of educator Sal Khan of the Khan Academy] after which they talked for four hours. ‘Dan adores her and supports her,’ the friend added.They tied the knot on September 1 at their home in Katonah, New York, surrounded by family and a few close friends.